Sunday, February 17, 2019 at 3:30 p.m. They've conquered London, Paris, Vienna, Berlin, Tokyo, New York and L.A. They've garnered over 35 million hits on YouTube. 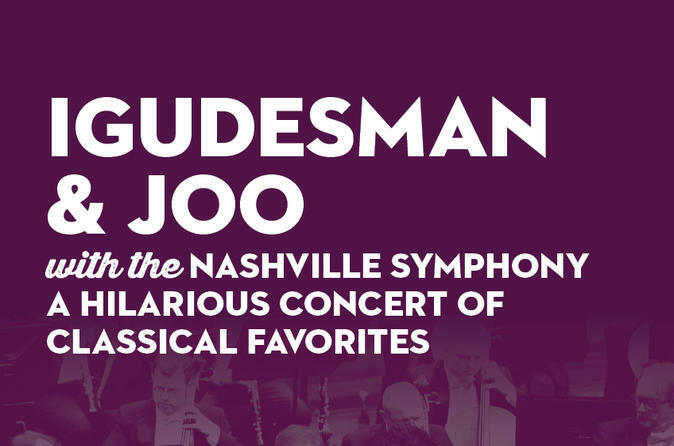 Now the talented and hilarious duo Igudesman and Joo take on Music City with a theatrical concert featuring in an unforgettable mashup of comedy and classical music featuring your Nashville Symphony. Musical selections will include Mozart Bond, Alla Molto Turca, A Very Blue Danube and Cleaning vs. Riverdancing, with music by Beethoven, Bach, Rachmaninoff, Strauss, Vivaldi & more. Igudesman and Joo's dream is to make classical music accessible to everyone, so bring your friends and family for this one-of-a-kind concert experience.